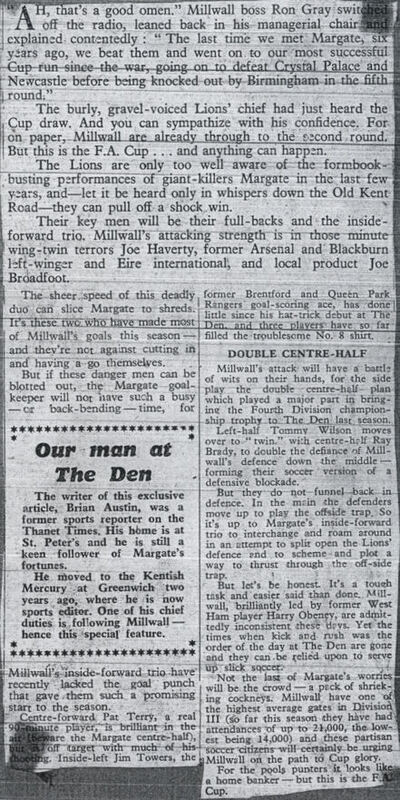 Margate travelled to London to take on Millwall who were 15th in Division 3 at the time and lost 3-1. 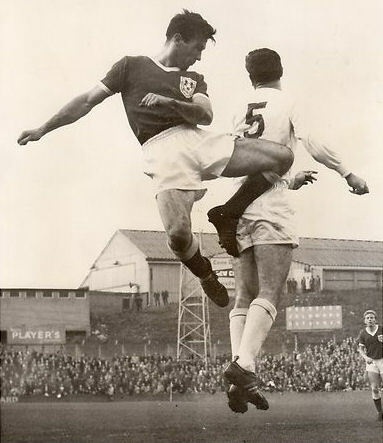 Above: Bob Harrop (number 5) and Millwall's Pat Terry. 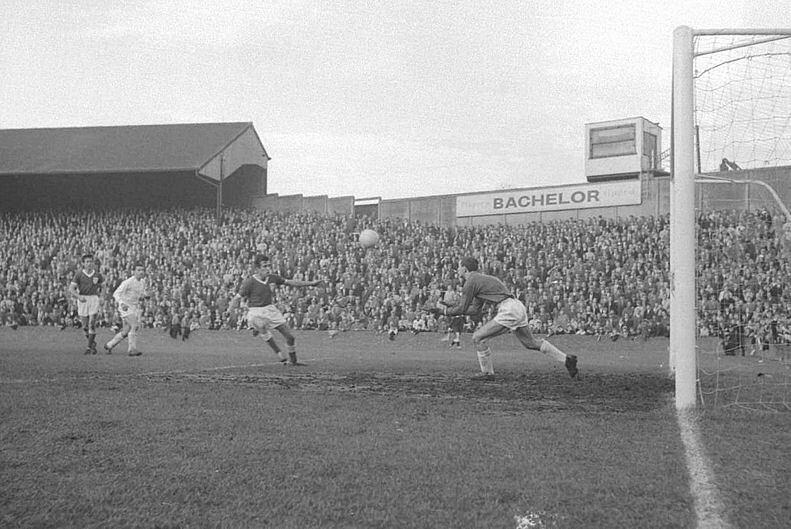 Above: Brian Hughes makes a catch as Jimmy Fletcher (left) looks on. 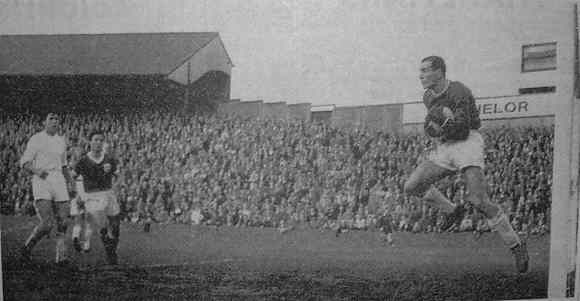 Above: Another catch for Brian Hughes. 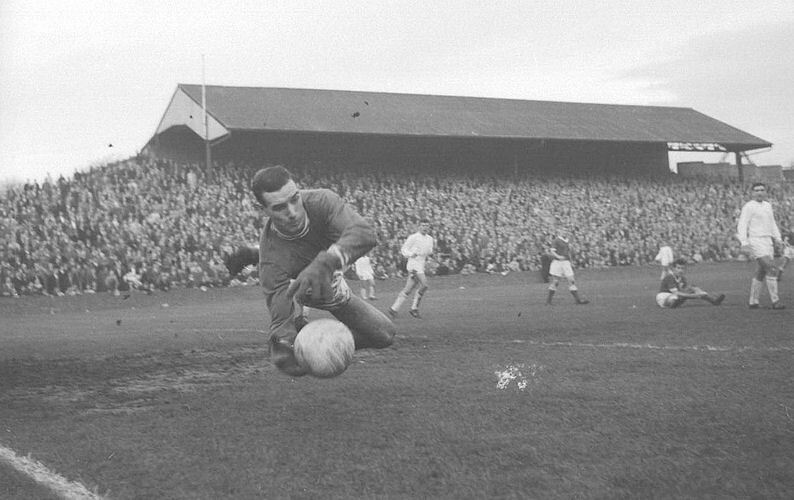 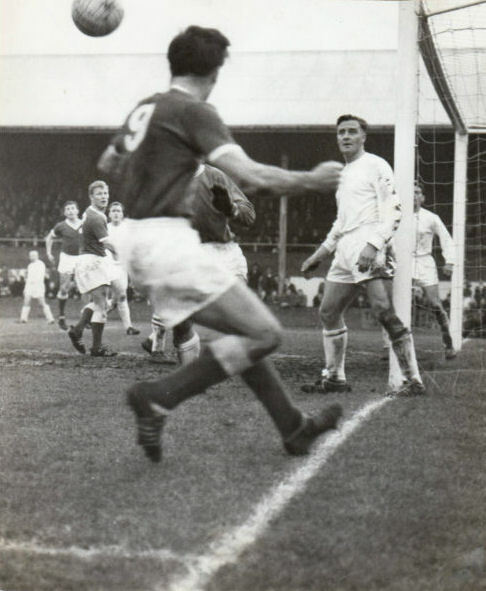 Above: One of the Millwall goals, Bill Parry is the player in the foreground. 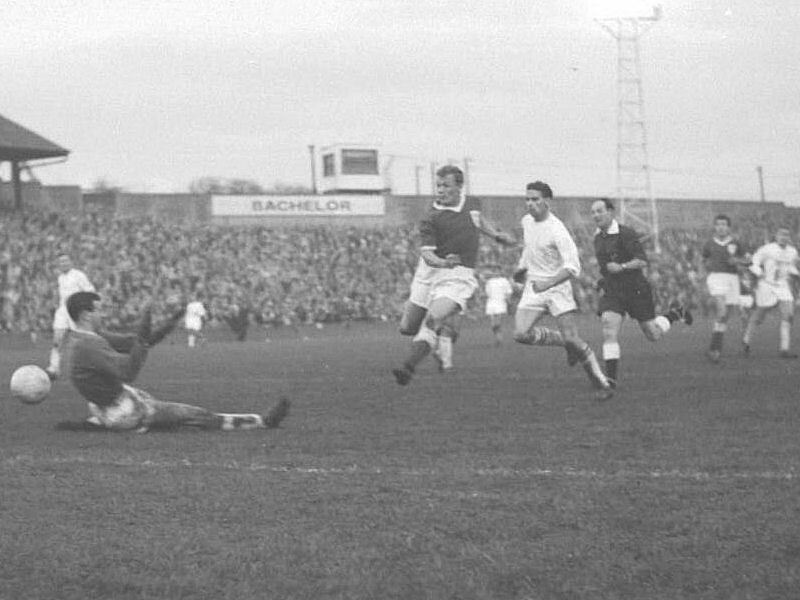 Above: Brian Hughes makes a flying stop, David Hills is in the centre and Bob Harrop on the right. 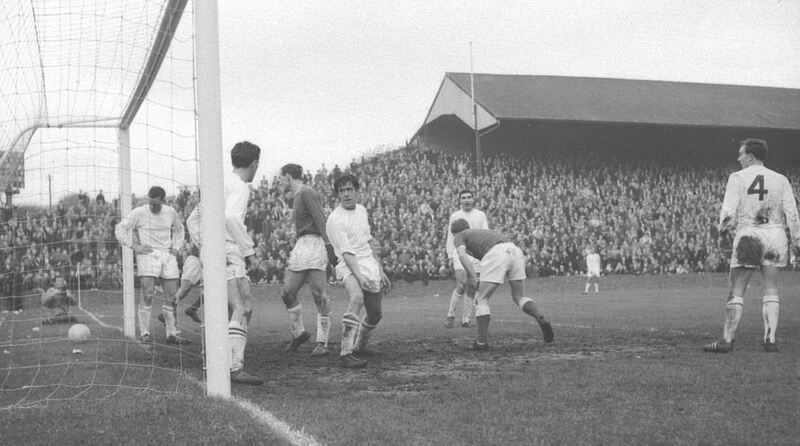 Above: The aftermath of a Millwall goal, the Margate players from the left are Terry Joyce (looking down at the ball), Bill Parry (near post), goalkeeper Brian Hughes, Jimmy Fletcher and Bob Harrop. 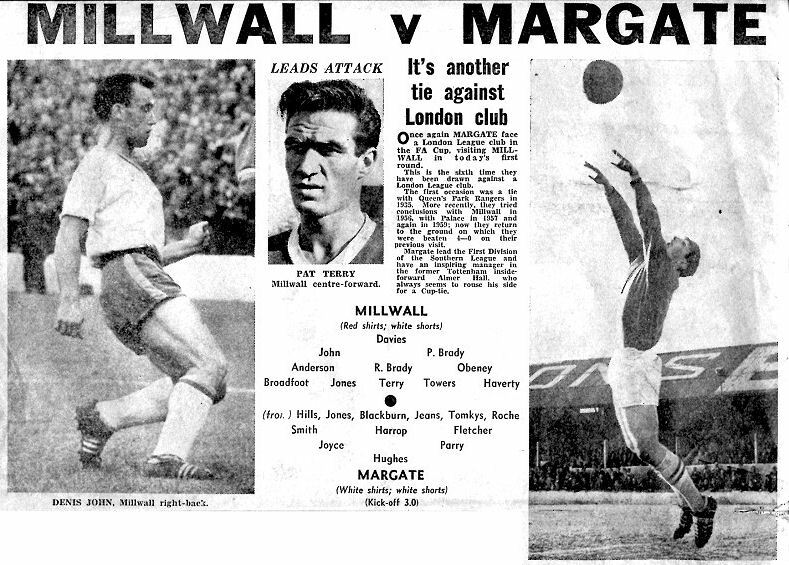 Above: Cyril Jeans gets a shot away, Alan Blackburn is the grounded Margate player to the right. 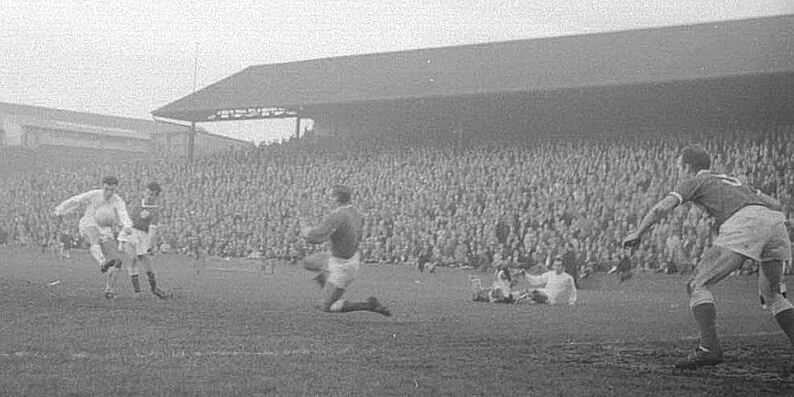 Above: Moments before Millwall's third goal - Pat Terry (9) heads the ball back across from a deep corner and Joe Haverty then put the ball into the net. 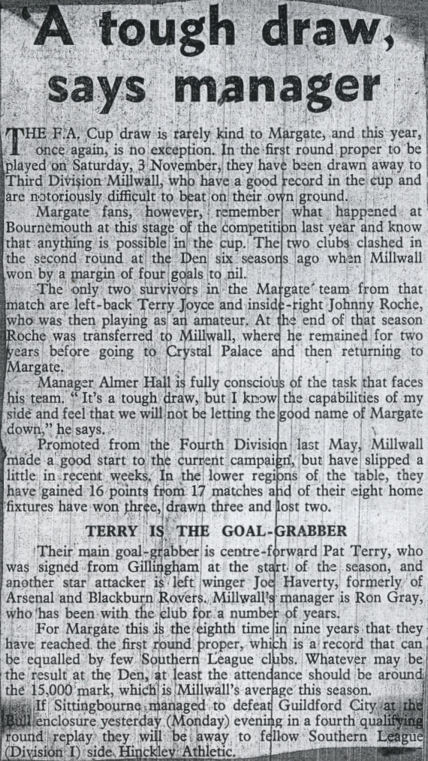 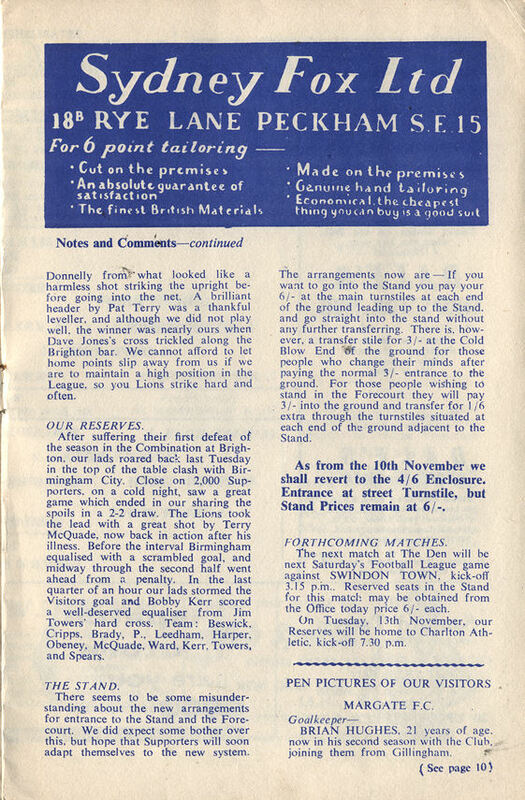 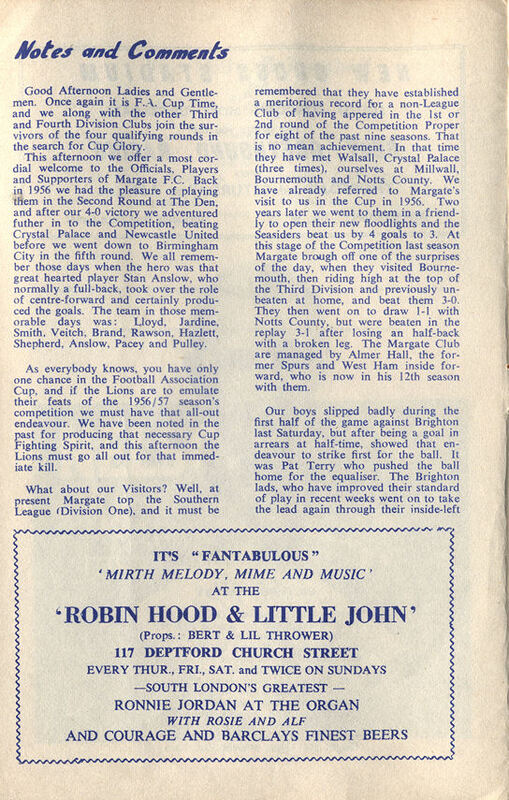 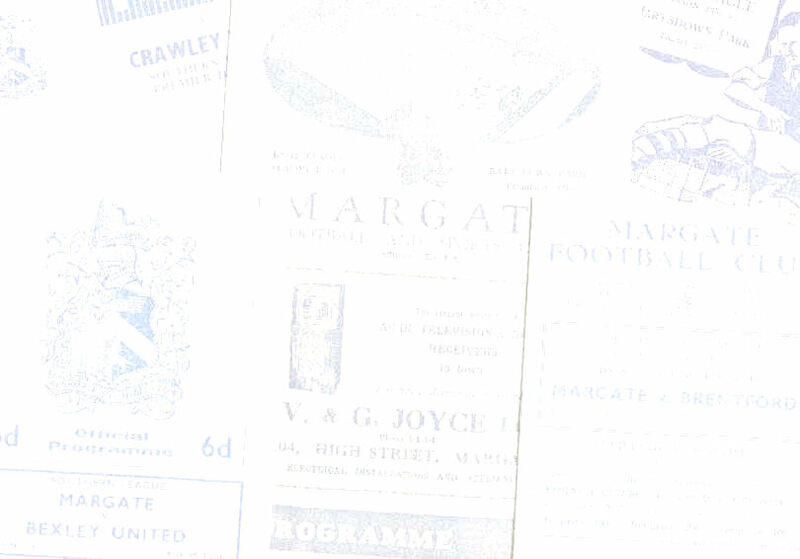 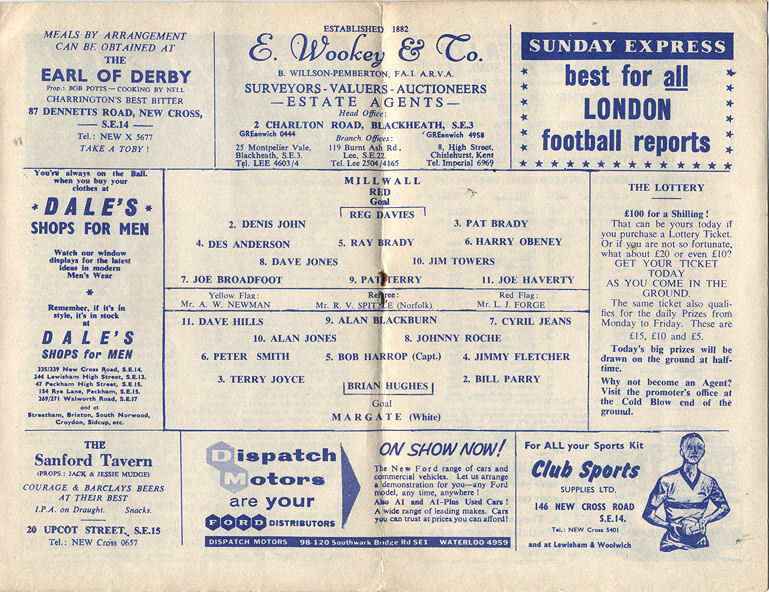 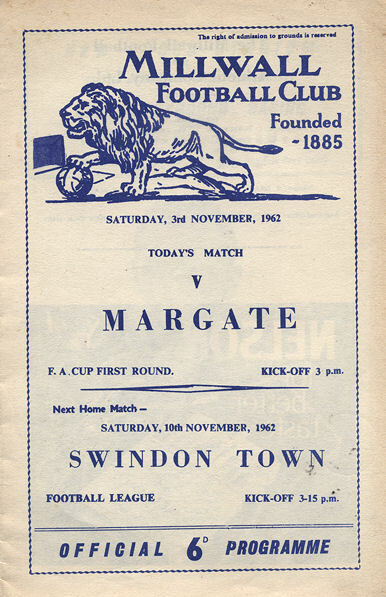 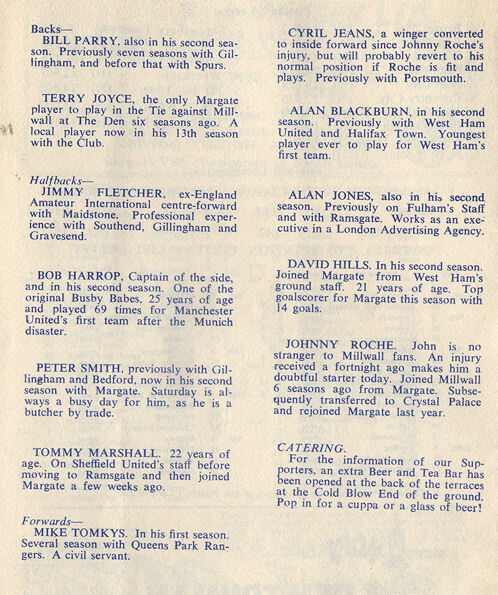 The Margate player on the post is Terry Joyce.